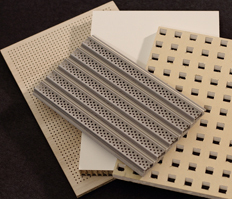 Lantorisol is an acoustic system specially designed for requirements during dry lining construction. The system consists of various materials – acoustic nonwoven, trickle protectionnonwoven as well as a protective webbing. The Lantorisol acoustic system has established itself as the standard over many years whereby other systems are evaluated against it. Lantorisol materials are suitable for commercial builds, above all for use in schools, sports halls as well as children’s nurseries. Using the navigation keys you can find a detailed description of the individual materials as well as a technical data sheet listing the most important technical properties. The sample folder Lantorisol can be simply and quickly ordered at the special webpage we have set up under sample order.